Narrow web label printing system leader, Afinia Label, announced they will be exhibiting at WestPack in Anaheim, CA from February 9–11 in booth 5450. Attendees will be able to see many popular labeling solutions, such as the Afinia Label L801 Color Label Printer, DLF-1000 Digital Label Finisher, A300 Label Applicator, and the Epson C7500. We have seen growing numbers of organizations moving to digital for the flexibility required to manage diverse product offerings, private label distribution strategies, and frequent changes to label content. Narrow web label printing system leader, Afinia Label, announced they will be exhibiting at WestPack in Anaheim, CA from February 9–11 in booth 5450. Attendees will be able to see many popular labeling solutions, such as the Afinia Label L801 Color Label Printer, DLF-1000 Digital Label Finisher, A300 Label Applicator, and the Epson® C7500. The Afinia Label DLF-1000 Digital Label Finisher laminates and cuts labels, without dies, directly from Adobe Illustrator or CorelDraw. The DLF-1000 is the perfect solution for producing labels of any size or shape, and is compatible with printed rolls from Afinia Label’s L801 and R635 Color Label Printers. 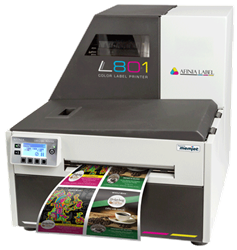 The Afinia Label L801 Color Label Printer, powered by Memjet technology, is capable of print speeds up to 60 feet per minute with an industry-leading low ink cost of less than three cents for a typical 4” x 6” label with 75% coverage. The L801 supports three print modes: Roll to Roll, Roll to Cut, and Print & Present. Epson’s ColorWorks™ C7500 inkjet printer allows businesses to dramatically reduce label costs, increase operational efficiencies and quickly produce high-quality, durable, full-color labels. It is ideal for high-mix, low-volume applications and features print speeds up to 12 inches/second. The Afinia Label A300 Label Applicator applies up to three labels on a cylindrical container and includes an optional rewinder for the label liner. The A300 is compatible with purchased rolls of preprinted labels, as well as labels produced by digital printers such as the Afinia Label L801, or Epson ColorWorks. Afinia Label emerged as a digital label printing system leader in 2012 when they collaborated with Memjet to create a commercially viable narrow web label printing solution. Afinia Label is now one of the largest distributors of Memjet-based label printers in the world, with products available in 55 countries. Afinia Label is a division of Microboards Technology LLC, a leader in specialized printing solutions. Their twenty-year history includes leadership in disc duplication, 3D printing and, most recently, digital label printing. More information can be found at http://www.AfiniaLabel.com, Twitter or by phone at 1.888.215.3966.